I think they found one! I recently had a great conversation with Chris Rose from Future Teaching Scholars, an initiative from the Department for Education that’s being run by the Education Development Trust. They are doing something new and exciting with recruiting Physics and Maths teachers: part-funding students through their undergraduate Physics- or Maths-related degrees, with efforts to have these potential teachers become invested in the job that we love and to spread that love. I’ll talk more about it why I think this is the best thing to come to Physics and Maths teacher training later, but it did make me wonder where we were in our recruitment issues around Physics and Maths teachers. Where is teacher recruitment at now? There is a great deal of commentary on the teacher shortage, and I’d need the patience of a proper birder to analyse every detail behind it. There are obvious issues around retention, despite what the Government would want us to think, and there are key subject areas that are hit the worst. Geography certainly plays a part; try Hertfordshire, where I am, for size – paying London house prices without the London pay, or a school hiding out in the sticks. Too many teachers don’t have a degree in the subject they teach. Around 28% teach Physics without a related degree, and around 20% for English and Maths. It stands at over 40% in Computer Science and Spanish! Some of these statistics do provide reason to worry. Primary schools have had to recruit more teachers in order to accommodate the additional student numbers and moving clockwise in the recruitment game will see the second(ary) player having to perform the same moves. What about the ‘shortage subjects’? For the sake of this section, I am following the DfE in what they consider to be the most needed subjects: Physics, Maths, Chemistry, Computing and Languages. There are a number of subjects who are ‘worse off’ in terms of meeting demand for training places (Design and Technology, Religious Education), but there is a higher priority placed on subjects like Physics and Maths where the proportion of teachers needed to graduates produced is particularly troublesome. A significant problem with the shortage subjects is that it can become a very vicious cycle: more students are taught by non-specialists, fewer students continue to complete an A Level in the subject, fewer students complete a degree in the subject, fewer graduates available in those subjects, even more students are taught by non-specialists, etc. What efforts are being made to tackle this? The NAO report outlines how difficult it is to measure the impact of bursaries. The DfE claim that for every £1,000 increase in bursary there is a 2.9% increase in applications, but even if this was the reason for the increase in applications there is not enough research or evidence of the longer-term impacts, or even if these teachers took up a job following training or stayed in the job for more than a year. The DfE spent £620 million on bursaries in the five years to 2014/15, with a boost in number of trainee physics teachers coming when the new physics bursaries were introduced in 2012/13 (again, who knows if this was the reason for the boost). Interviews and focus groups have provided evidence that those changing career to come into the profession are particularly attracted by the bursaries. There are various other scholarships offered by institutions linked to the subjects, such as the Institute of Physics or the Royal Society of Chemistry. These are for a select number of trainees and are usually from £25,000 and upwards. This is an excellent incentive – but what are the longer-term impacts of these? 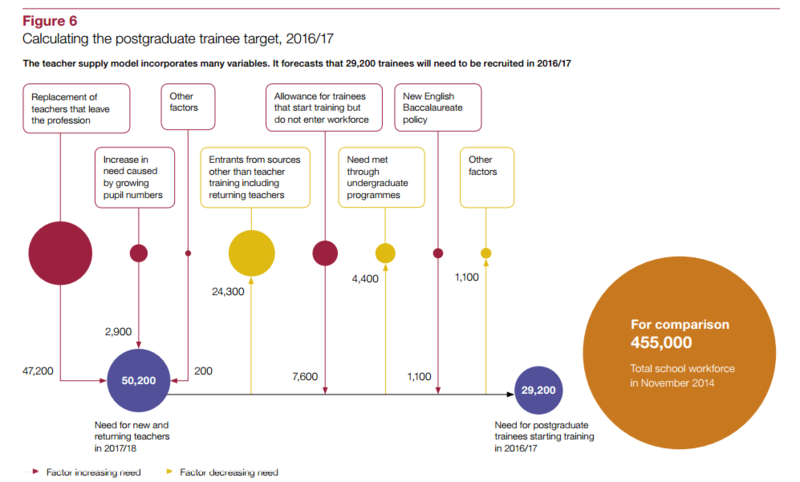 The obvious ‘failure’ is that you will receive a tax-free training bursary that is far beyond the £22,000 taxed salary for a first year teacher, and it can take a while if you tend to move up the scale one point per year to get back to the amount that you earned in training. Schools do have the flexibility to place you at a different point on the scale, of course, or if they are academies then they can do as they please entirely. It is in the interest of schools to be flexible when it comes to pay for these teachers, though financial restraints can make this difficult to justify. The Gatsby Foundation have a beautiful infographic and a great video looking at Physics recruitment and retention. They have invested £millions into the growth of Physics teachers numbers and their initiatives include links with the Institute of Physics, providing mentoring support for early career teachers. It is pleasing to see these considerations beyond those that are simply financial. They have also helped with Subject Knowledge Enhancement courses, that non-specialists can use that helps support them in building strong and lasting subject knowledge to improve the quality of teaching in the classroom; an attempt to reduce the non-specialist teaching and student A Level/Degree uptake cycle. As I touched on at the start of this post, I think the Future Teaching Scholars is a very worthwhile and innovative approach. This is an entirely new concept to teaching (as far as I can tell). Year 13 students apply for the FTS programme and the best are selected to attend an assessment centre where they have to do some teaching, take part in group activities and the usual interviews. The successful candidates are expected to be invested in the programme: they are part of FTS for six years! They receive £5,000 per year as a grant whilst they complete their undergraduate degree in Physics or Maths. Throughout this time there are national events that they take part in, and each year they spend a certain number of days in schools linked to FTS. They are then helped through the training process, doing so in an FTS-linked SCITT, and are supported towards their first job. They continue to be involved until the end of their second year of teaching, paying back by attending events and spreading the word of FTS and of teaching. It’s a bit like one of those huge companies that swoop along and give final year secondary school students a free pass through university in order to have them employed with them at the end. FTS and EDT have smartly taken this idea and are looking to give grants of £5000 for each year of a degree to 110 undergraduates who have signed up to the Future Teaching Scholars programme. I’m convinced that we need to spread the word to our students and across leaders in schools. 110 additional graduates in Physics and Maths that are guaranteed to become teachers for at least two years, raising the profile of teaching to Year 13 students as the word spreads, is not something to be sniffed at.